Nice design, and a great idea to opensource the plan! Open source designs for “real” things such as Global Village Construction Set, RepRap (open source 3d printer that can print itself), Ronja (low-cost appliance for optical network connection) – and now cool home designs – become a trend now. Thanks. I think open source is the way in this case. The extreme climate imposes certain requirements. The communities have big needs, etc. Getting contributions from others who have firsthand knowledge and specific skills should improve the design and increase the likelihood of these houses getting built. I like this layout. You should look into releasing the plans under the creative commons license. That way you could reserve a commercial license for example. If anyone started making money off your plans you would have a recourse. You would always have to option to just say whatever. I don’t know i just like creative commons licensing. Post here when the plans come out I would like to get a copy of them. I like Creative Commons’ Attribution-ShareAlike (CC BY-SA) license most. It requires attribution of work to the original author, allows commercial use, and allows derivative works, and requires that these works to be shared to the public by same license terms. Thanks Alexey and Christian. This sounds like the best way. Perfect! Love it. Want it. Plan to build a house in the next year on my land. Like this one a lot. I’ve been trying to decide what form to use. It has everything I need/want. I’d love to have the plans when you are finished. Thank you much. I was hoping to get input from other designers and architects, but so far this hasn’t happened. So I’m already sending the plans. Just leave a comment or email me if you want the current version. Am following your plans here. Will get them when you release. Thanks! Sorry, I’m not an architect or builder. But I’m wiling to try your plans. I would love to have the current version of these plans, if you wouldn’t mind sending them. I’ve been planning on building a similar house for awhile now. Okay, I’ll send in a few minutes. You can fill the bags with local soil. Volcanic rock would be even better. No cost estimates are available because costs vary so much from one area to another. I heard that typical 3-4 bedroom houses cost $350,000-$400,000 in parts of Alaska. Wow. This Solar Pit House has to be way less expensive. I’ve been in some Frank Lloyd Wright buildings and he built to his height, so some entries have ceilings around 6’6″ and it makes it difficult. Thanks. It would be easy to raise the height a bit. Okay, but please decide on this or the Economizer. The Economizer is far simpler and easier to build and seems most suited to your situation. Would the concept of the pit house apply to a Sonoran Desert home? There was a earth roof building built commercially in Tempe, AZ. I have been attempting to build a version of your pit house for a few months. Your design has strengthened my idea. Do you consult on others ideas? Thanks for the many months of inspiration! You definitely want vertical glazing to prevent overheating. This would require modifying the plan. No big deal. Yes, I do consulting at $50/hour. Send money to my PayPal account at earthbaghouses [at] gmx.com and then we can brainstorm ideas via email at strawhouses [at] yahoo.com. Get photos of the house you’re interested in to facilitate the process. I was wondering if this (or any other earthbag plans) would be suitable for building on the gulf coast in southern alabama? we would like to berm the house as well so we dont have to worry about the storms. You would want to redesign it for your climate — build on high ground, use vertical greenhouse glazing, create a roof overhang to prevent overheating, make storm shutters, improve the ventilation, etc. etc. My husband and I are looking at this design for a home in eastern Oklahoma, do you think it would need any modifications? also we are currently trying to figure out the cost and were wondering if maybe there was a supply list or something of the like we could use as a starting point? This is for very cold northern climates such as Canada. You would want to eliminate the glass on the roof and add vertical windows on the south like my Zero Energy designs (search this site). I love this plan and the layout. Very simple. The only thing I wold do differently would be to put the door to the bathroom on the left in the WIC making it a Master Bath. I think this would make sense considering you have the other bathroom in there as well. Maybe even flipping the 2nd bath and pantry and add a second door to the 2nd bath in the WIC as well. If this was a guest bedroom then the guests could have access to the bath without walking out into the kitchen at night. Would love a copy of the plans if you have them. Go to our Natural Building Blog. Click on House Plans at the top of the page and then Free Plans. There you can download the PDF plans. I am wanting to build one of these for my girls and I and well, due to the way everything is continually rising in living expenses and all, I feel something like this can be done while I am able and would support us wonderfully, is there a new version of the plans as of yet? Your buildings/ideas have always intrigued me, true as such as I have already made purchase of $800 in feed bags. We are going to start on your backyard hobbit house this spring so that I may practice without starting on too big of a project to begin with, but would appreciate any other versions or the pit-house design you may have, as well information on building in Missouri’s climate. Thanks for all that you do and have done for others. There’s just the one version at the moment. It’s for northern cold climates like Canada. The sloped windows would overheat in Missouri. Vertical glazing is best for your area. That will allow light to enter but not overheat. However, this changes the roof and so you might want to hire someone to modify the design for you. I am available for custom designs. My email is at the top of the page. That’s fine for greenhouses. But in this case the south facing windows provide the only daylighting into the home. I’d suggest reworking the design with vertical glazing for hot climates. Readers might remember my offer a couple weeks back (see our Natural Building Blog) to do a free earth sheltered plan if there’s enough interest. 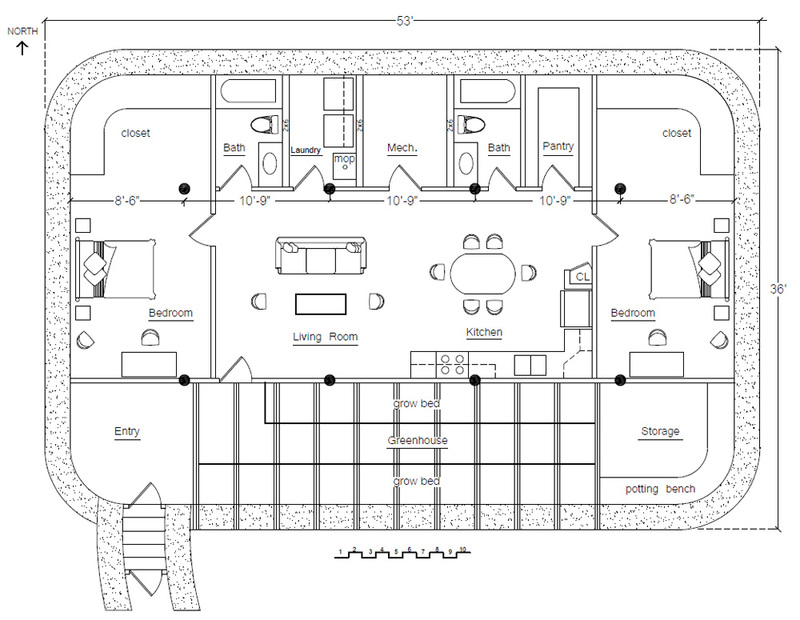 Well, this Solar Pit House plan is popular and so maybe this is the one worth working on. Another good side of this is that vertical windows are generally easier to install. Yes. Also snow doesn’t build up on top, they’re easier to clean and less likely to leak. Our email is listed on all of our websites. The Solar Pit House is for far northern climates. You want vertical windows. Search my Zero Energy plans. Is it possible to get the plans for this solar pit house? I absolutely love it! Yes, this is one of my free plans.